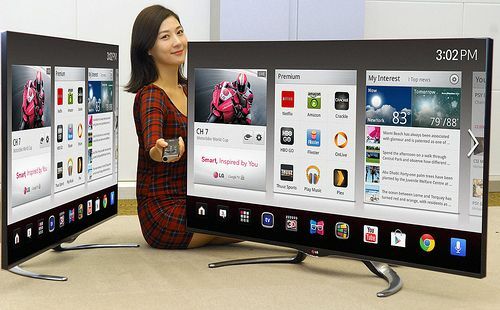 At the moment, LG is offering two TVs based on the Google TV platform. For the next year they are preparing two additional lines (the GA 7900 and GA 6400) with a total of seven models and five different diagonals. The new models will have a very thin edge and an attractive stand. The GA Series 7900 will have a 47 and 55-inch LCD model with a backlit edge LED technology. The platform these new TVs will run on is Google TV 3.0 with support for voice control, and remote control via LG Magic Remote (the microphone is actually located in the remote control). One unique feature of this controller is that user controls the TV by tilting the remote similar to the Wii controllers. The premium model will have company's CINEMA 3D screen. This move by LG could mean that they are afraid of the redesigned Apple TV that should come in 2013, and that would mess with their plans, so they are trying to get as much publicity as they can before that happens. The public will be able to see these models live TV at CES, and they should hit the market in the first half of next year.